Father Christmas in Italy is known as Babbo Natale; 'Natale' being a derivative of the Latin word natalis meaning 'birth'. It's from here we also get the route for the word noël. It has only been relatively recently, though, that the Italians have adopted Babbo Natale as their Christmas present-giver. Many countries have some form or other of Santa Claus, a figure who has evolved from the tales of 4th century saint, Nicholas. Saint Nicholas was known for performing several miracles, doing kind deeds and leaving secret gifts for people, as well as his kindness towards children. You can see how Santa Claus developed over time from this image. Though many European countries have a form of Santa Claus, Italy traditionally has its very own Christmas figure who is unique to their culture. Befana is an old woman or witch who visits children's houses on the eve of the Epiphany (the 6th January) and leaves presents for them. The story goes that Befana was an old house keeper who was approached by the Three Magi or Three Wise Men prior to the birth of Jesus and, though different versions alter the specifics, essentially Befana tried to locate the baby Jesus herself by following in their wake, planning to bring him a gift. To this day she searches, leaving presents at the houses of all the children she passes. 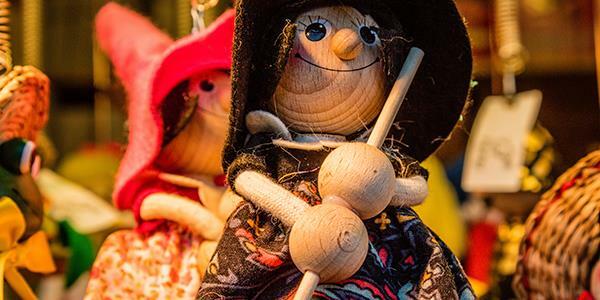 You will often see Befana figures or decorations in the streets at Christmas time; a little old lady either riding or holding her broom. The Christmas season in Italy usually lasts a few weeks, beginning around the 6th December which is the Feast day of Saint Nicholas, and concluding around the 6th January, which is the day of the Epiphany. In some households children will leave their shoes out on the evening of the 5th December ready for Saint Nicholas to fill with presents to be opened the next morning. In other households they will wait for the 6th January and the Befana. But the majority of people in Italy now do their present opening on the 25th December, same as in the UK. Food is a really big part of Italian Christmas and throughout December you will see a range of Christmas markets laden with different foods and regional goodies. The traditional Italian Christmas cake is the panettone which is a deep sweet bread that is baked with dried fruit. Variations of the recipe also exist and chocolate panettone is becoming increasingly popular. The cake is served in slices and usually enjoyed with coffee.